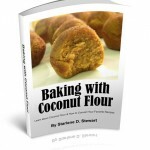 Today I’m reviewing Baking with Coconut Flour by Starlene Stewart. Starlene Blogs at GAPS Diet Journey. Let me start out by saying that I loved this book. Starlene’s book doesn’t just include recipes, it shows you how to work with coconut flour, how to get the recipes to turn out correctly AND how to convert your own recipes to being coconut flour baked goods. As someone who has gone grain-free and is sitting on literally hundreds of baked good recipes I’ve written over the last seven years, this is a God-send for me. Coconut flour is lower in carbs than grains, it’s nut free and it’s low-oxalate. Right now, coconut flour fits well into my life for the occasional baked good. I limit myself to one small treat on the weekends. Now I can convert my favorite low-sweetener recipes into a treat I can still have without worries about the oxalate count or the carbs. That goes a long ways to keeping the morale up. Baking with Coconut Flour contains information about what coconut flour is; why use it; where you can find it; comparisons of brand by age, volume and weight; how to measure it and how to get your batters to the correct consistency. Starlene goes into the details of why some coconut flour recipes flop and you just don’t get good results like the recipe that you followed shows in their picture. She gives you tips on how to get recipes you find online or in coconut flour baking books to turn out correctly. Then she takes you step-by-step through how to convert a variety of recipes that weren’t written for use with coconut flour. She shows you four recipes and how to convert them, gives you the converted recipe and a picture of what to expect. She even includes a copy of the worksheet that she uses to convert the recipes. I used Starlene’s directions to convert a cookie recipe this past weekend and I was very happy with the results. If you’re leaving grains behind or switching to coconut flour for other reasons, this book will not disappoint you. If you’d like to see an example of Starlene’s recipes with coconut flour, hop on over to her blog and check out her Strawberry Medallions. Then go here to order this awesome eBook.